Sign up to pitch and download the application here: https://heartlandsharktank.com/. Calling all entrepreneurs and startup founders: Here's your chance to swim with the sharks. 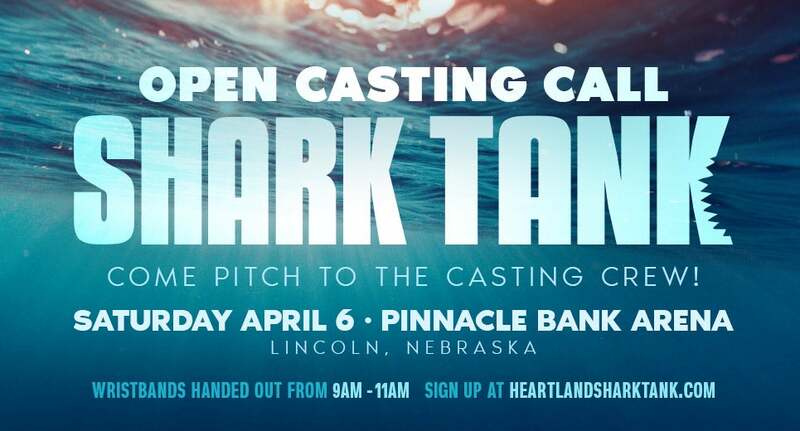 "Shark Tank," the popular ABC show where business owners pitch their ideas to a panel of potential investors, is hosting a casting call on April 6 at Pinnacle Bank Arena. The opportunity is organized by UNL's Engler Entrepreneurship Program. Attend the Open Casting Call for an opportunity to give a 1-minute pitch of your business/product/idea to a member of the Shark Tank Casting Team -- just like you would as if you were on the show. Come prepared to wow and dazzle! All Open Calls are open to the general public to pitch. As long as you arrive during the allotted "Numbered Wristbands Distributed" time and receive a wristband you will have the chance to pitch. Wristbands will be handed out from 9 am – 11 am. If you arrive after 11 am, there is no guarantee that you’ll have the opportunity to pitch. No need to line up early or camp out, everyone who arrives in the time frame will have a chance to pitch! You will have approximately one minute to pitch to a Shark Tank Casting Producer followed by Q&A – just like on the show. You are welcome to bring product examples and displays. The pitch will take place in front of one seated casting producer, most likely with several pitches taking place in the same room. This video helps give an idea of the environment: Video. You will have time to go back to your vehicle after you receive your wristband to get any large or bulky props or equipment. There are no guarantees of access to power, internet or any other A/V equipment. You may only pitch one business, product or idea. The general public will not be viewing the pitches. It’s just between you and the Shark Tank Casting Producer. All ages are welcome! If under 18 years of age, please bring a parent with you. Please fill out a Shark Tank Application, and bring with you the day of the event. Please take the time to fill it out legibly and completely. For questions specifically about the Casting Call Pitch, please email [email protected]. Please DO NOT call the venue. Can I watch the Pitches? Sorry no, each pitch is just between the casting producer and the entrepreneur(s) who are pitching. When will I find out if I'm going to be on the show? After the casting call there’s a long process before you would end up on the show. The Casting Producers be in touch following the casting call if you make the cut. Wristbands will be handed out from 9 a.m. – 11 a.m. and we want you to be there at that time to be ensured that you will have a chance to pitch. If you come after 11 a.m., there’s no guarantee that we’ll still have slots open. View the tips we’ve created here, and watching Shark Tank episodes will help! Will I get to pitch to the actual sharks? Unfortunately, no, the Sharks only have time in their busy entrepreneurship schedules for the taping of the actual show in Los Angeles. But this is your chance to visit with and pitch to the producers who could help you get to the actual Sharks! Do I have to pitch to watch the speaker's series? No, the speaker series is open to the public as well. Part of the Institute of Agriculture and Natural Resources at UNL, the program gives students an opportunity to take an idea from concept to product in an encouraging environment where they can try, fail, and try again, all while learning what it takes to be an entrepreneur. More than 100 students have completed the program to date.